"They call me the Healer.They say I was once the greatest asset of the Immortal Societies. They think I'm broken. Jaded. Lost. They are wrong. "Retired Bastian covert operative Conrad Greene has but one wish left. To live out the rest of eternity away from immortals and humans alike. But when a plane crashes into the Amazonian swamp where he has been hiding for half a century, the jaded immortal healer who was once the greatest asset of the Bastian First Council stumbles across a conspiracy involving the newly elected President of the United States. Caught in the middle of the intrigue is Bastian intelligence operative Laura Hartwell, the one immortal on Earth most likely to put a bullet through Conrad's skull.Coerced into returning to the life he had left behind, Conrad reluctantly agrees to assist the American government with their investigation. But as disturbing events start to unfold around the globe, Conrad and his team of elite human and immortal agents find themselves facing an elusive organization hellbent on shifting the power balance of the world. As chaos descends on Western societies and an old empire rises once more, can Conrad stop the deadly countdown that threatens to alter the course of human history and regain the trust of the woman he loves? 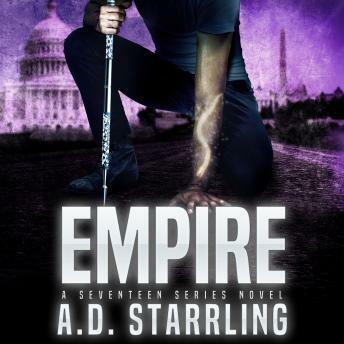 Empire is the riveting and fast-paced third installment in AD Starrling's bestselling supernatural thriller series Seventeen. If you like high-octane adventures that combine science and fantasy, then you'll love the world of Seventeen. Grab this electrifying thriller and continue the adventure today!